With celebrities, there is sometimes only a thin black line between reality and fiction. 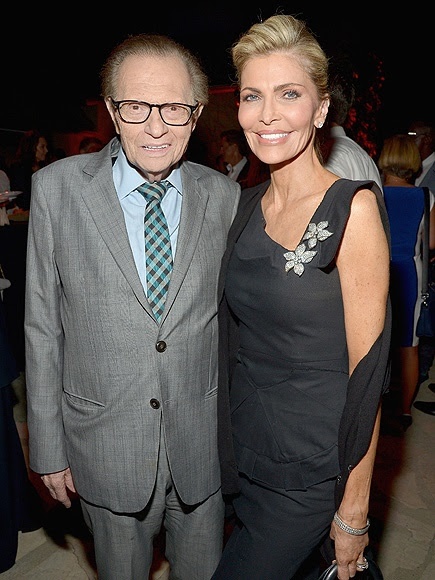 It now seems that Larry King's reconciliation with his wife Shawn, but a source close to the TV star says the couple's relationship is a "sham." "This is an emotional façade they've been putting on for years"
"They're still miserable, arguing and sleeping in separate rooms, yet they continue perpetuating a front for the cameras." It appears the Kings insist that the public must be given an impression that screams 'we're okay!' even when they are miles from that. Just days after reports surfaced that Shawn had a yearlong affair with British public speaker Richard Greene, the couple stepped out hand-in-hand on Monday. "It's laughable," adds the source of the Kings' denials in the past week. "People in his inner circle know the truth. It's beyond absurd." The deception goes even further, to even more ridiculous lengths. The couple also taped an interview last week chalking up the cheating reports to rumors. Here's an excerpt from the interview, with the veteran king of talk putting up a performance of his life. "It's an interesting word, 'rumor.' You know, I'm been in the business – next May'll be 60 years – and I've dealt with rumors a long time, interviewed people involved with rumors. Rumors are what they are – they're rumors. And I tell you the truth: I don't pay any attention to them," Larry said on Hallmark's Home – Family on Friday. Dealing with celebrity scandals is a difficult task, but there are even deeper and sadder reasons why Larry is deciding to keep the marriage together. As for why King, 82, is staying with his seventh wife? "He has a fear of being alone, and given his old age his fear is heightened even more," "He's just emotionally paralyzed."